Review Context: I have played all the core Pokémon games and many of the spinoff games. I’ve also spent time playing through Candy Crush and Bejeweled. There have been many questions over the past few years about Nintendo concerning the rising popularity of mobile games versus the handheld market. 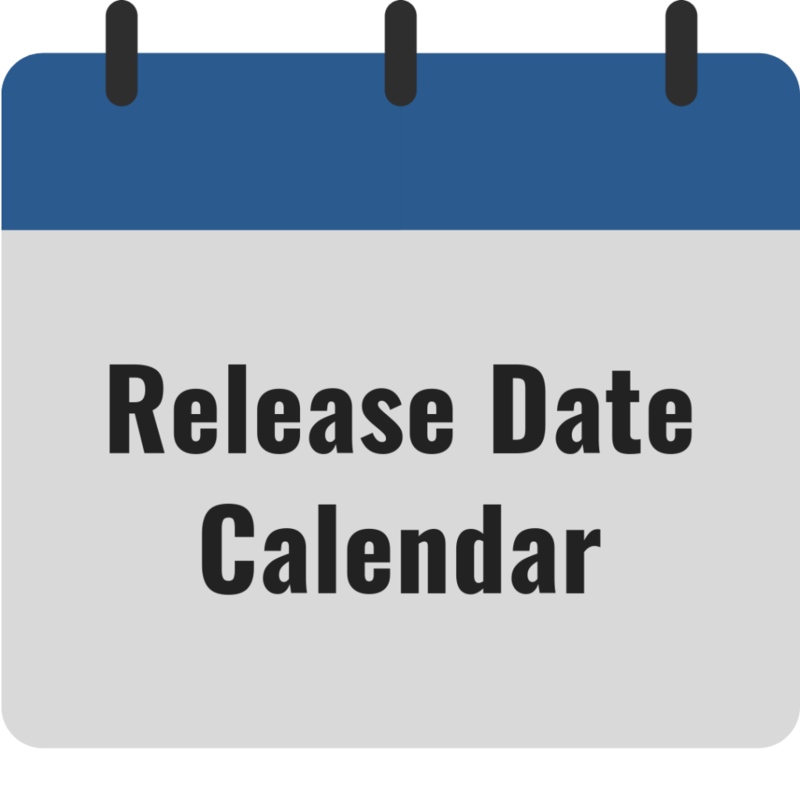 A big one is, how is Nintendo going to compete or adapt? 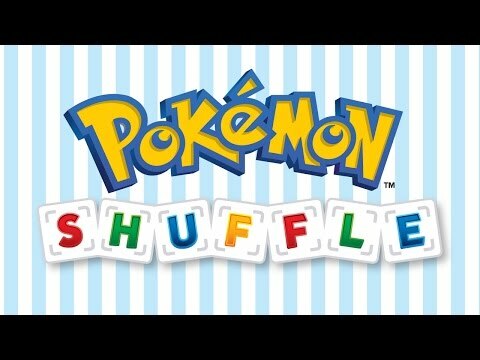 Pokémon Shuffle is our first look at this evolution, but will it put Nintendo on a path to become a master, or be a shameless pay-to-win artifact? 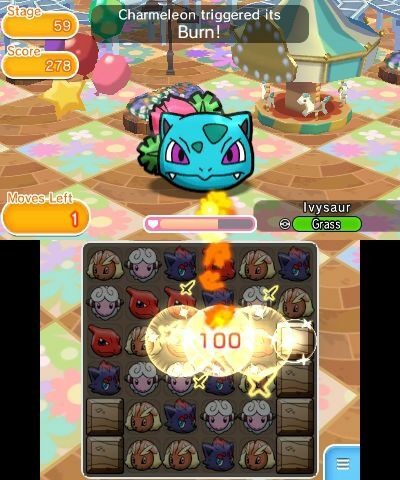 Pokémon Shuffle is a match-three puzzle game in the same vein as some popular mobile games you may know. As you progress through the game you get to battle and catch Pokémon. The more you catch means the more prepared you are for future battles. Pokémon will level up as you progress that will cause more damage when you attack. Build bigger combos to do more damage and win the battle faster. Like other games of this style have adapted, you have five lives to play with. When you start a stage you use a life, then that life will slowly replenish over time. You lose this life if you win the stage or lose. This, unfortunately, really limits how long a play session will last. Battles feel like a twist on a normal Pokémon battle. Each Pokémon has their type that will be weaker or stronger against other types. Veteran Pokémon players already know how this works. For example, you use water against fire and it will deal more damage. This ultimately helps you finish the stage faster and gains you more points for the stage. Mega evolutions return to help make battles better. When you have a Pokémon that can mega evolve you will build up a meter that will lead to the evolution. Once you have the mega on the stage, each mega has a special ability that can affect the stage and clear a large amount of tiles to do extra damage. Pokémon Shuffle has the normal layout that you maybe use to from some mobile games. 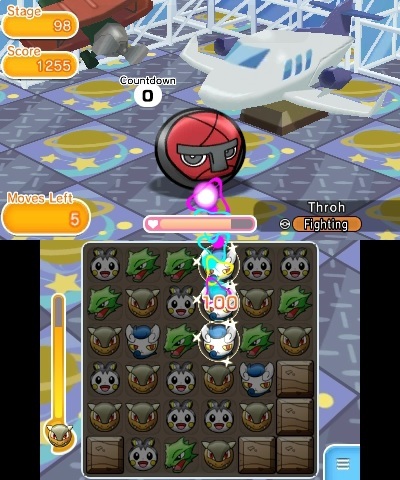 There are special stages that add more Pokémon to the game. There is an event Stage that will hold a Legendary Pokémon and then there are daily random stages that hold some rare Pokémon or a special Mewoth stage that can get you some extra coins. The Legendary stages do change as they are special events, in fact all these special stages are subject to change. There are also the Expert stages that are very challenging, but will offer Pokémon such as Charizard or Blastoise. The difference between the normal and expert stages are the way the battle progresses. Normally, you have a set of moves given to you, but in expert mode you are given a time limit in to make your matches as quick as possible. This changes the entire dynamic of the game and requires you to think fast because every second is precious. Like normal, when the battle is done, every second left over goes to boosting the catch rate. Being free-to-play does come with kickbacks of course. As mentioned earlier, when you start a stage you use a life. When you run out of lives, you either wait or you can regenerate all your hearts back by using a gem. Gems are Pokémon Shuffle’s version of currency. You obtain gems through casual play but they don’t come up often. Have no fear because you can purchase them. You can buy one for a dollar and six for five, etc. This may seem like a pay wall or something to force players into spending money, but frankly this doesn’t hinder gameplay and you can easily progress through the game without spending any extra money. The music in the game is fitting for the game. Nice and easygoing, it’s something you can easily listen too and it helps get you into the game. The visuals are simplistic, but it holds up with the art style and even though you only see a Pokémon’s head, they are all very pleasing to look at. Overall, Pokémon Shuffle is a fantastic free-to-play game. The term free-to-play may scare or turn off a lot of interested players but please, for this game, don’t let it. This game, like your typical mobile game, is great to have a quick play session if you are on a fifteen-minute break at work or waiting for the train or bus. While playtime can be really short per session, each stage is fun and adds something new to keep the game fresh. Catching new Pokémon will help change your team and going back to catch missed Pokémon adds a lot of replay value. So even though all the troupes and hindrances of a mobile game are unfortunately present, the game is something any Pokémon fan or 3DS owner should checkout. Plus, you can’t beat the price of free.